A Strong Team for Complete Patient Care; LVNs and RNs Working Together. The CVNE is committed to excellence in Vocational Nursing Education, and has established the Educators Scholarship. The scholarship fund was initiated by a generous donation of a revered member of the CVNE in honor of her mother, and dedicated to provide financial assistance to CVNE members pursuing professional development through higher education. For more information on the scholarship and to review the scholarship application procedure, click the link below. Established in 1968, CVNE has been a strong voice in support of vocational nursing across the state of California, promoting the principle that LVNs are an integral member of the health care delivery team. Education enhancing presentations, legislative information and industry-critical information is shared between members of CVNE at conferences, via the use of technology-based communication and through informal networks established at CVNE events. CVNE also partners with the Board of Vocational Nursing and Psychiatric Technicians (BVNPT), which furthers its impact. 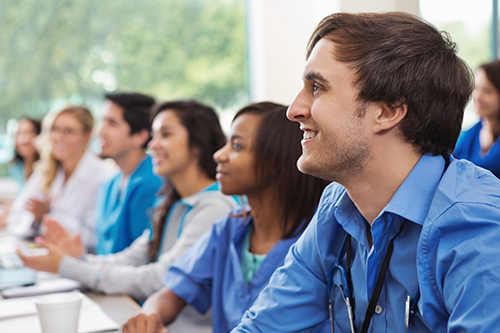 California VN Educators is a non-profit organization dedicated to the support of vocational nursing education by providing educational and networking opportunities for the vocational nurse educator. CVNE produces Biannual conferences with seminars offering board approved continuing educational credit. Planned by the Executive Board with member input, these conferences provide opportunities for continued professional development for nurses as educators. This collaborative effort ensures quality and relevant resource. CVNE scholarships offered to conference attendees at random and through application, offer educational advancement opportunities to vocational nurse educators.